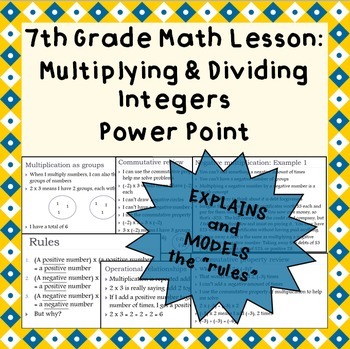 This 20-slide, CCSS-aligned lesson is a great way to teach your students the conceptual reasons behind the 3 rules for multiplying and dividing integers. Lesson takes students through various explanations (multiplication as repeated addition, multiplication as grouping, commutative property, number lines, debt forgiveness) for why a negative x positive = negative and why a negative x negative = positive. This lesson assumes students have a mastery of adding integers and an understanding of number lines. File is in .ppsx (2010 PowerPoint Show) format, but if you would like a compatibility version, please email me at madeyemoodyproductions@yahoo.com for details. If you decide to purchase, please leave a comment about this product. Thank you for your business and feedback!